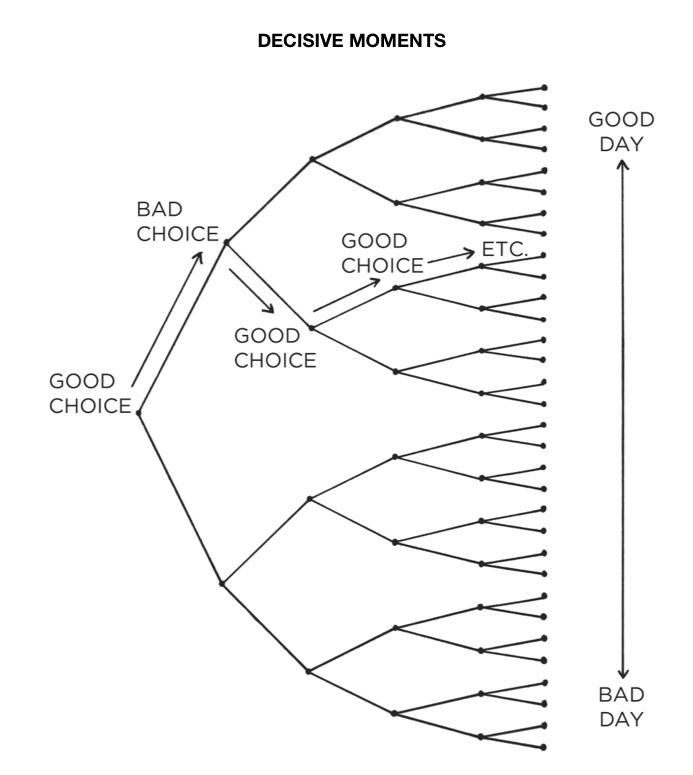 The difference between a good day and a bad day is often 3-5 productive and healthy choices made at decisive moments. We all start on the left side as soon as we get out of bed, and the decision we make there will have a huge influence whether our day will be a good one or a bad one. And there are a few other strategic decisions, that can have disproportionate impact on the rest of our day. Another illustration is of walking into a restaurant; our options are constrained by what’s available in that restaurant. This is why mastering these 3-5 decisive moments in our day is so important. These little habitual choices, often made without much thinking, “stack up, each one setting the trajectory for how you spend the next chunk of time” (161). 1. When I wake up, do I look forward to the day with joy in God or do I look ahead with dread and fear? 2. Do I read my Bible and pray before checking email, the news, social media? 3. Do get to work as soon as I sit at my desk or do I allow myself to be distracted by the latest political news and opinions? 4. Do I shut off my mind and devices from work when I come home in the evening in order to give myself entirely to my family, or do I attempt to be half at home and half in cyberspace. 5. Do I get to bed no later than 10pm after a period of non-digital wind-down or do I just go to bed when I feel like it? 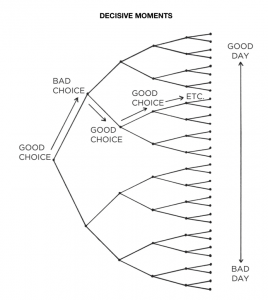 The more we can identify our on-ramps and make conscious decisions to take the right ones at the right time, the more likely we will end at the top of that graphic rather than the bottom. And, of course, if we take wrong turn, we can ask God for forgiveness and grace to get back on track. He can turn the worst choices around and give us a good day even after the worst of choices. Where bad decisions abounded, there did good days much more abound. But we shouldn’t presume upon that two days in a row!